Can the Apple Watch 2 actually last a marathon? I'm on the train heading up to to the north of England, where I'm racing the Chester Marathon tomorrow. I'm desperately trying to work out how to copy Apple Music playlists from Spotify - turns out there's no way to easily duplicate across platforms without paying money to use random desktop apps. The reason for this is I want to imbue my Apple Watch 2 with enough music to power me around the marathon tomorrow, where I'll be properly testing it over 26.2 miles. 'Properly' is the key thing here. I've recently run 22 miles with the watch simply on GPS tracking, and over three and a half hours it managed to lose only 50% battery, which was a surprising result. But for Chester tomorrow, I'll be shoving this thing a little harder, turning on the LED heart rate monitor on its underside and streaming music for it via Bluetooth - it'll be sucking the absolute life out of the battery so we'll see how long the Apple Watch 2 can really last. Hence me trying to work out whether Apple Music is any good. I've been an avid fan of Spotify for years, but if I want to shed the phone for the run then I'll need to switch to Apple's service to actually get any tunes on the Watch. (Well, I could buy them on MP3, but come on, we're not living in 2003). There's another issue: in the UK we're not allowed to use headphones in many races, as the covering of your ears has been classified a safety problem (if you can't hear marshall's instructions telling you you're about to run over a cliff or into a road full of cars). But there's a way around it: bone-conducting headphones, which sit just in front of the ears, keep them open but also shove sound into your head by vibrating your skull. I've got my hands on the Aftershokz Trekz Titanium Bluetooth headphones, which I've been loathe to use in races even though they're legal. The issue is that most race organisers aren't aware of the exemption for this technology, and I've spoken to a few runners who have had to argue disqualification as a result. But thankfully times are changing, as Chester Marathon is one of the earlier races to promote using bone conducting headphones, so I'll be plopping them on my head before I take the start. I'll be honest though - I don't feel like I can rely on only the Apple Watch for this race, as there are still a number of things it just can't do - namely, upload to Strava from the Workout app. In fact, I can't do anything with the data from the Watch 2, other than look at it on the iPhone - so I'm strapping the Garmin Forerunner 735XT on my other wrist for a 'proper' runner's watch. It costs the same as Apple's option but is filled with all manner of metrics to analyse your jogs (and hikes and swims and cycles and yoga among others…). It'll be an interesting comparison between the two: I'll be connecting the Garmin 735XT to a chest strap for more accurate heart rate data, so I'll be able to see how well the Apple Watch 2's monitor will track my pulse. The 735XT also has an INSANELY good battery life, so it'll be nice to see how well Apple's wearable does in comparison. I'm really not sure how well the Apple Watch 2 will fare in the race. I've done a few runs with the watch at 'full' capability, and over 47 minutes it lost 16% battery. Given I'm hoping to complete this race in around three and a half hours, that would still see me with around 25% battery remaining… But life is rarely that easy. I can see a few (more) beads of sweat inching their way down my brow as the last few miles inch into sight, the Apple Watch 2 telling me that low power mode should be activated. Actually, I can actually imagine myself not giving a crap by that point, as I'll be so desperate to finish the hell of the marathon that I'd probably happily give the Watch to someone if they'll run the final few miles for me. 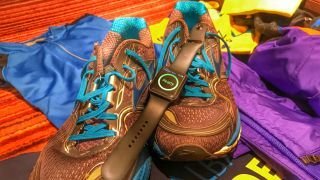 Gareth Beavis is TechRadar's Running Man of Tech, testing the latest in fitness technology in a never-ending quest to run further and faster and bringing you the results right here.